Angeline Morrard, a Breton apothecary, is the proprietor of Angeline's Aromatics in Solitude. Her niece, Vivienne Onis assists her in the store, and takes over ownership of the store if her aunt dies. Angeline used to sell perfumes for use in homes before the war, hence the store's name; she now caters to adventurers and soldiers. Angeline wears a set of merchant clothes, a pair of boots, and a hat. She carries a key to her store, and a selection of common loot and gold. 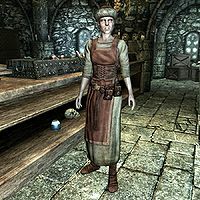 If you ask Angeline for Alchemy training, she declines, saying she's just a simple herbalist, and refers you to Lami in Morthal. Angeline will ask you if you have been to Whiterun. If you tell her you have, she will ask for news about her daughter. If you say you have no news but are willing to bring some back to her, Angeline will mention that her daughter was stationed in Whiterun after joining the Imperial Army. She asks you to talk to Captain Aldis for information about her daughter. Angeline refers to herself as "Angela" in her voice files, and she is referred to by that name during the quest No News is Good News as well. When investing gold in Angeline's store, the chat option does not disappear. Therefore it is possible to invest repeatedly in her shop. However, because of the way the script works, she does not retain this gold. Consequently it is impossible for her base gold to be raised by the investing perk. This page was last modified on 13 June 2015, at 03:19.